This has also run on Strong Towns and This Old City; these are the permalinks for both. Looking at these two links--Hector Street, Conshohocken, and 6th St., Bella Vista--which is wider? Looking at these two links--Broad Street, Philadelphia, and Avenue Kléber, Paris--which is wider? The answer is neither. In each example, both streets are the same width, but the way the width is expressed is different. The middle example is, of course, familiar to Stroad to Boulevard readers; let us concentrate on the bottom example. where the planter+tree on one side represents the bumpout, and the parked car on the other the parking lane. Visualize the tree above the car, and the car below the tree, to get a better idea of how it looks in reality. Notice how scrunched up the sidewalk is, and how vulnerable the cyclists. 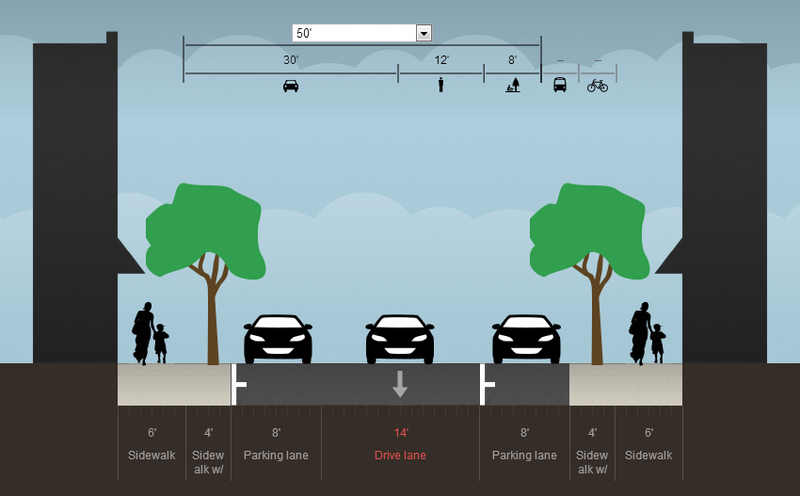 Both examples have nine-foot sidewalks and eight-foot parking lanes. In the Netherlands, the travel lanes are only ten feet wide, and the cycle path looks to be eight feet; in the US, the travel lanes are 12 ft. each, and the cycle path is six feet. Both add up to 70. But also notice how the placement of each use in the street communicates information about it. In the US example, cars are clearly given priority, not just by being given wider travel lanes, but also because the bike lanes are placed in such a manner as to expand the travel lanes' clear zone. There are no bumpouts, and so the trees are scrunched along the curb, and pedestrians forced onto the sidewalk. Of the seventy feet, a whopping 52 is part of the car realm, just shy of 75%. This means that for every unit of pedestrian space, there are four of auto space, a ratio of 1:4. By contrast, in the Dutch example, cars are clearly subsumed. The travel lanes are narrowed, and the parking lane is interspersed with bumpouts; the parking lanes now become the edge space. The bike lanes have been pulled away from potential conflicts, and widened slightly. The sidewalks remain the same width, but there are no trees to present barriers. In this example, a mere 36 feet of seventy is part of the auto realm, if you count the bumpouts as also part of it, giving a ratio very nearly 1:1. Why streets in the US are so wide? There is space for two row of parked car on both sides and about three times the width of a vehicle in the middle. But technicaly there is no need to park on the road because most house have one or two garages and a lot of space in front of them. I think that`s a waste of space and structure. Because until a few years ago, people looked at safety data from rural roads, and found that roads with 12 ft lanes and wide shoulders had fewer crashes. So, they applied this to residential streets, and guess what? It hasn't worked. Instead of being safer, people drive down these streets as if they were on rural highways, at speed much too fast for neighborhoods. In the future, you'll see roadways designed more closely for the functions they play in the overall road network, with narrower city and neighborhood streets. The psychological assessment of width the commentator exhibited is what I am calling perceived width, or alternately the perception of width. 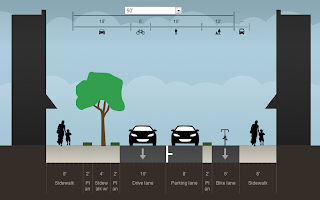 Unlike absolute width, which is determined by the lot lines, perceived width is determined by the modulation of the street--how much is given over to cars and pedestrians (and whether bikes are treated as cars or pedestrians)--as well as setback depth (if any). Optimal modulation has the two major users evenly split the street, and setbacks, if they exist at all, be purely ceremonial (no more than 15 ft. or so), or be shielded by an edge along the lot line, created by trees or bushes. We'll assume no setback, since that kind of space is usually (a) green and (b) in the public way of neither. That is, it is neither of the auto realm nor of the pedestrian realm. Cars need a spatial minimum. The absolute minimum is often thought of as ten feet a travel lane, and eight feet a parking lane; parking lane accesses can, however, be nine feet. 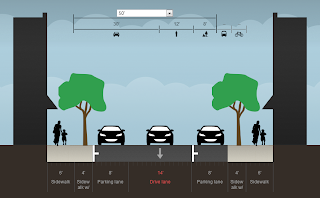 Give-way streets need slightly wider travel lanes, so that the car giving way can pull into a space without having to go through a full parallel-parking maneuver. Let's say 14-18 feet for them. which uses the bumpout/parking strategy to increase available space without losing trees, but in addition narrows the travel lane and adds a cycle path. In this design, 26 feet are part of the auto realm, and 24 the pedestrian--as close to a 1:1 ratio as a 50' street is likely to get. I find myself going into Stroad to Boulevard territory here: notice that there is 30' of pedestrian realm on either side of the street, versus 16' on Broad Street. The bike and parking functions are both elements of a single shared service street, which the sidewalk spills onto; transit islands can also be installed on the green medians separating the two realms from one another. The bottom line isn't just that there is more people space--and less car space--on the Av. Kléber; it's also that one perceives of the Av. Kléber as being more humanized, and narrow, than one does of Broad, which feels more autocentric, and wide. 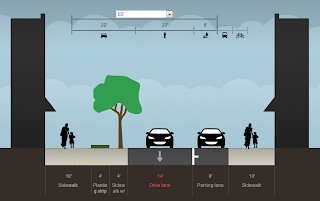 The perception of width is the psychological element of street design. Psychologically more humane streets tend to attract more pedestrian activity, and more small-scale, innovative, and experimental economic uses catering to pedestrians. It is, at engineering scale, the same thing a parklet signals: the idea that people care about the street as a street, and not just a place for automobile movement and storage.